Since I’m going to GP Manchester and I don’t go to that many GPs, I might as well start thinking about the deck now. Actually I already did a bit, but since everyone seems to be playing black online, I thought I’d make an effort and look into something different. First, it seems to me that Constellation could actually work. Not sure how well, but could. 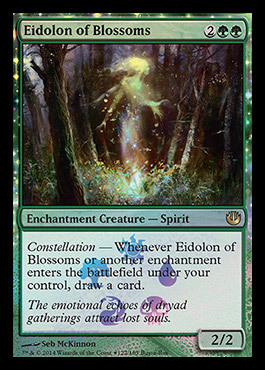 The one Constellation card I’m actually interested in using, is Eidolon of Blossoms. Sadly, none of the other Constellation cards really appeal to me, but this one is very good. Potentially. What I want to do is to pair him with an enchantment generator, namely Heliod, God of the Sun. Those clerics are, after all, enchantments. The good part is that you can actually then make enchantments at instant speed, which would make some other Constellation cards much better, but on the other hand, there’s Deicide which is already an insane card against us and that would make Heliod much, much worse, so we are not going to put that many Heliod’s into the deck. There’s also good white removal in the form of Banishing Light which is basically a new iteration of Oblivion Ring. Many of the one-of’s could probably be cut in favour of something better. Our sideboard would probably need to be aware of Stormbreath Dragon at the very least, but also possibly all sorts of graveyard shenanigans decks, as well as the everpresent Esper. Oracle of Bones is there for the fun factor, mostly, although it could get them at times. Its hard to play against, since you don’t really know what the other player might be holding. Also, Oracle into Twinflame must be extra fun. This entry was posted in Magic: The Gathering and tagged brews, deck, theros by Aki Vainio. Bookmark the permalink.